Inland from the Pacific Ocean, the city of Los Angeles is bordered on most sides by rugged mountains which provide the only barrier to the continued expansion of its sprawling suburbs. 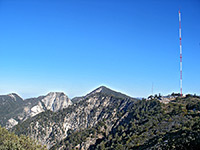 The northern aspect is dominated by the San Gabriel range; this has several peaks over 9,000 feet, the highest being Mount San Antonio (aka Mount Baldy) at 10,064 feet and Pine Mountain at 9,648 feet. The hills are not nearly as spectacular as the Sierra Nevada mountains 150 miles north but they and the surrounding Angeles National Forest do encompass nearly 700,000 acres of quite scenic wilderness and have the advantage of being only a half hour's drive from Pasadena and Glendale, at the northern edge of the Los Angeles metropolis. The foothills (starting at just 1,300 feet) are grassy and rather barren, but the land becomes rockier and forested with oak, pine and cedar at higher elevations, hence more interesting for hiking. The mountains also harbor streams and reservoirs good for fishing, small lakes, waterfalls, old mines and steep narrow gorges suitable for canyoneering. 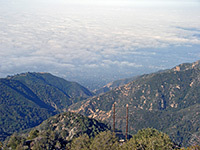 On 10th October 2014, most of the range became part of the 346,177 acre San Gabriel Mountains National Monument (managed by the USFS), created in part to enable greater environmental protection. 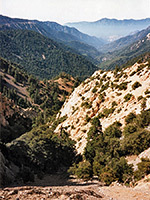 Several roads climb into the San Gabriel Mountains (see map below), and although all are paved they are sometimes very winding, steep and narrow. Most traveled is the Angeles Crest Highway (Route 2) - this climbs steadily, starting, in the west, from La Canada Flintridge on I-210, and peaks at Dawson Saddle, elevation 7,903 feet. 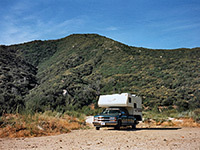 En route it passes side roads, trailheads, deep and scenic forested ravines, viewpoints of distant mountain peaks, several official forest campsites and plenty of places suitable for free camping. 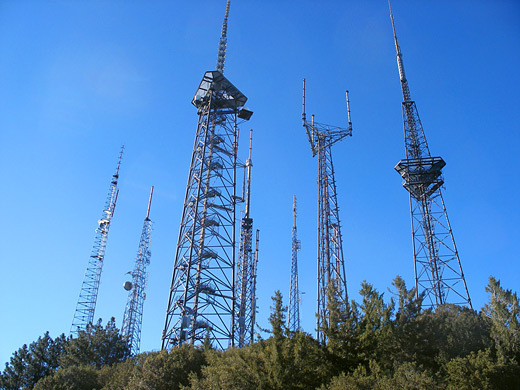 One of the main turnings is a 4.5 mile road to the summit of Mount Wilson, site of many aerials and communication towers, plus several overlooks and trailheads; this is perhaps the best place for elevated views of the northern Los Angeles suburbs, 5,000 feet below. A few miles east of the highpoint of Route 2, the road reaches the northeast edge of the mountains, high above the San Andreas Rift Zone and within sight of the start of the Mojave Desert, 3,000 feet below, where the land stretches to the horizon, parched, perfectly flat and criss-crossed by a regular grid of apparently endless straight roads. Back in the mountains, one of the southern side roads is Highway 39 which used to connect the Crest Highway with Azusa, via steep-sided San Gabriel Canyon, but this has been closed since 1978 due to numerous landslides. However, recent developments suggest it may reopen in the next few years. Significant snow falls on the mountains in winter, covering some places to depths of 10 feet or more. The roads are plowed regularly allowing visitors to reach the four designated skiing/snowboarding areas, at Kratka Ridge, Mount Waterman, Mount Baldy, and Mountain High - the most popular ski resort in southern California. 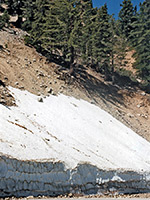 At higher levels patches of snow can persist until July, even while daytime temperatures may exceed 80°F. 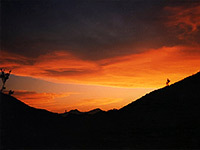 At this time people come to the hills for camping, photography, wildlife-watching, and especially hiking, with nearly 200 recognized trails to choose from.